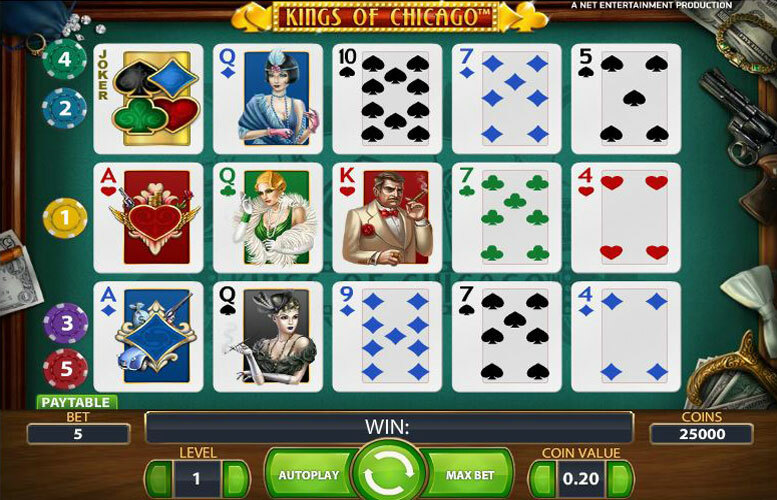 If you’re looking to play a simple slot game with a tasty 20,000 coin top jackpot then you should take Kings Of Chicago for a spin. There’s a wild to look our for which helps create wins and doubles all wins as well as free spins to be won which always yield big payouts! If you love poker and like slot machines then you may find this particular slot game enjoyable. It’s a 5 reel and 5 payline slot, which is unusual, but it’s got plenty going on in with a top jackpot of 20,000 coins, a scatter and a wild to look out for. For those that are really into the slot games but not poker however, chances are this particular game will be a disappointment. It does have nice clear graphics to it and the audio is not over powering but the only real interaction other than pushing the spin button that you will be required to perform here is perhaps changing your bet. There are no bonus games or gamble features. The entire theme is based on the card game poker and the entire paytable represents this as well. 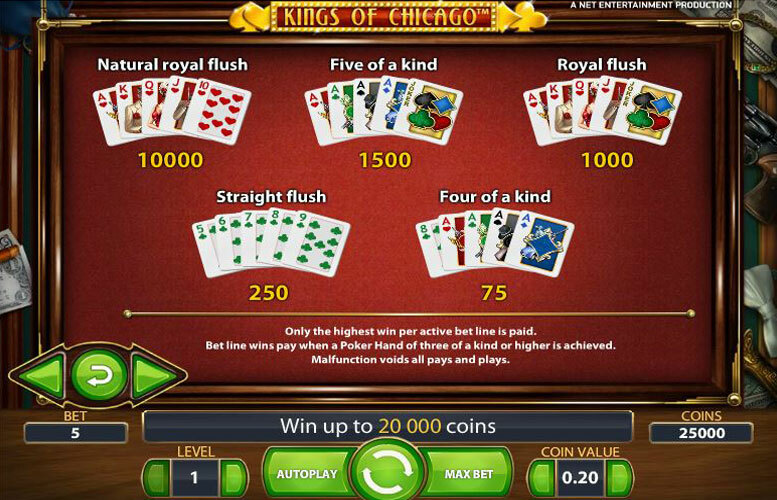 The largest win you can expect from Kings of Chicago is to spin and land a natural Royal Flush that will pay out 10,000 coins but if done done during a free spin round you winnings will be multiplied by x2 landing you the top jackpot of 20,000. Aside from that there are lesser wins with the right poker hands and the stronger the hand you can make the higher the payout you receive. You can bet from as little as 0.01 up to 1.00. You place your bet at different bet levels and coins values and you must play all 5 fixed paylines each time you spin. If you are playing the maximum bet then you will be playing at the maximum coin value at the highest bet level which works out at 50 coins per spin. At the min possible bet amount it’s just 5 coins per spin or 0.05. The symbols for this game are based on a deck of cards. There are 15 random cards that make up one spin. There are 5 columns across and 3 rows down. You have 5 potential pay lines that you can capture a win from. These are your three horizontal combinations, that is traditional to any slot game, with an additional formation of a pattern in a shape of a V, with the last pattern formation being an upside down V.
The wild card is symbolized by a joker. This makes the game a little more interesting in that if you strike a winning combination that contains one of the wild cards your win is doubled. The wild can also sub in for others to make more winning combinations. 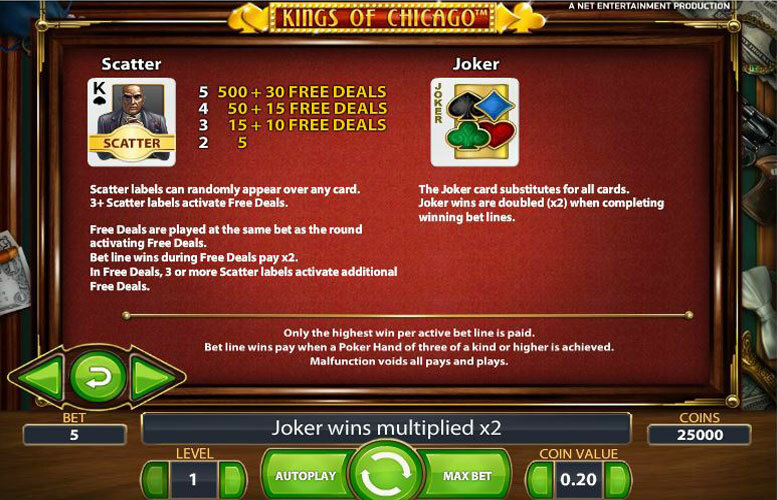 To make the game more in line with a slot setting there is the chance to win free spins with the King scatter symbol. If your spin happens to stop with 5 scatters appearing then you will be awarded 30 free spins (called free deals in this game). However, if you only produce 4 of the scatters you will receive 15 free spins, and 10 if you produce three scatters. 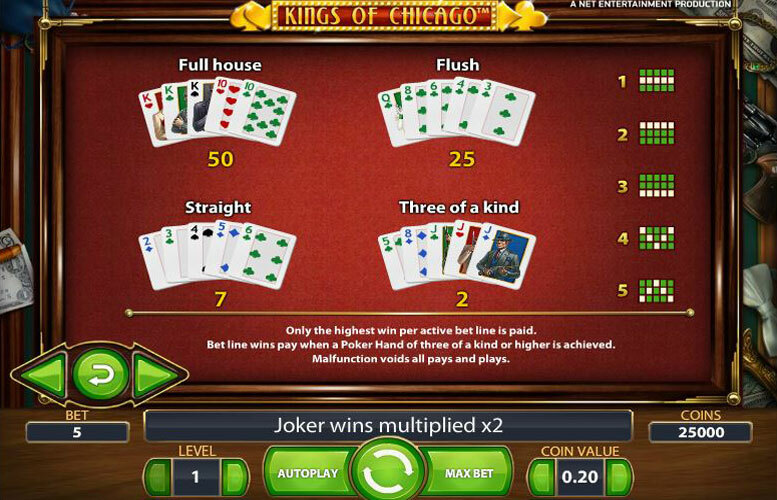 Significant wins can be realized of course depending on the level of betting but the ultimate win is the 20,000 coins awarded for the natural royal flush which is comprised of the Ace, King, Queen, Jack, and Ten all in hearts which appears during the free spins or deals round. The next best hand to this is a five of a kind that pays out 1,500 chips. Next is the royal flush with a payout of 1,000. The straight flush will give the winner who spins this hand 250 chips, and finally there is the four of a kind allotting the winner 75 chips. Although the symbols are that of selection from a standard deck of cards they do have some nifty looking characters on them that add to the fun of the game, and relieve some of the boredom that more enthusiastic slot players may be craving. This game has a rating of 3 / 5 with 333 total reviews by the users.